British heavyweight Tyson Fury says boxing has a "big problem" with doping. Fury, 27, will fight for the world title against Wladimir Klitschko in Germany on Saturday. Speaking to BBC Radio 5 live, Fury said: "I can look at a man and tell you if he's full of drugs by one glance at his body with his top off. "Boxing has got a big problem with drugs. But it doesn't bother me because at the end of the day it's about determination over drugs." The British Boxing Board of Control (BBBoC) said it was firmly against doping in the sport and general secretary Robert Smith told BBC Radio 5 live he did not agree there was a "major problem". Fury believes the only way to make things "fully fair" is to legalise doping in sport, but concedes taking such drugs can have a long-term impact on a person's health. "I think being in a democratic world means we have to be open to different things," said Fury. "Why don't they make drugs totally legal in sports and then it would be fully fair? "If the governing bodies want to do that, it will be a bit fairer. You can't tell me that 99% of these sportspeople ain't taking drugs if they've got bodies like Greek gods. "If a man wants to pump himself full of drugs it's only shortening his life isn't it? When you're pumping yourself full of drugs it's putting pressure on your heart, your liver, your lungs, your kidneys. In a statement, the BBBoC said it was "committed in its fight against drug use in professional boxing". It added: "The BBBoC has an extensive programme of out-of-competition testing and in-competition testing and will maintain its endeavours to combat drug use in association with United Kingdom Anti-Doping, who carry out all our testing procedures and disciplinary hearings in compliance with the Wada code." 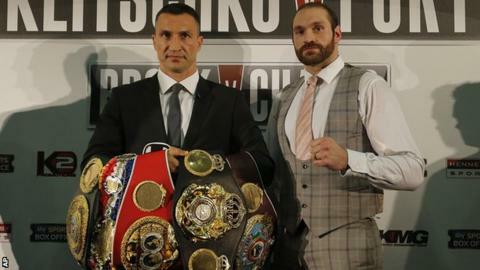 Ukrainian Klitschko, 39, is a heavy favourite to beat Fury when the two meet in Dusseldorf on Saturday, but Fury believes his opponent is "quaking". Manchester-born Fury, who is unbeaten in 24 fights, spent time in Klitschko's training camp in 2010. He believes his opponent, who has not been beaten for 11 years, was scared of fighting British heavyweight Dereck Chisora, who the Ukrainian twice pulled out of fighting, before Fury beat him. "He was very worried about fighting Dereck, who was unbeaten at the time and was the British and Commonwealth champion," said Fury. "He pulled out of the fight twice and I ended up fighting Dereck instead and I proved that he couldn't beat me never mind beat him. "If he was worried about Dereck Chisora, what is he going to be like against the 'Furious One'? He must be stepping on eggshells at the moment, he must be shaking in his boots." Listen to the Klitschko v Fury world title fight live on BBC Radio 5 live from 21:30 GMT on Saturday, 28 November.